Changing lives since 1998, this is the original course taught by the author at The Learning Annex & SpyFest. This 2015 SPECTRE edition has been expanded & updated with 40 extra pages of new information to empower all areas of your life. 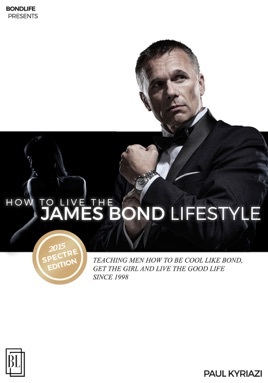 Chapters include: Re-invent Yourself, Bond Symbols for Change, Your Base of Operations, Your Appearance, The Bond Personality, Bond and His Cash, Your Bond Car, Bond Girls, Resort Hotels, Bond on the Job, Casino Gambling, Your Mission, Upgrading Your Image, The Greatest Adventure, The Ultimate Secret of Women & much more. Paul Kyriazi is the writer/director of six feature films, as well as travelogues and documentaries. He's directed 23 stars in his movies & full-cast audio-novels, including; Rod Taylor, Robert Culp, Nancy Kwan, Russ Tamblyn, George Chakiris, Adam West & Frank Sinatra Jr. This book is incredible for improving your life in all areas =) I highly recommend to all ages! This is a great book for upgrading your life or making it even better than it is now. It answers the questions of how can one live the prosperous life with minimal resources. Many have started off with nothing and risen to the life of even Mr. Bond. How can you get the cars, the cash, the fun and excitement? Well just read. It is hard work but this book will show you that it is worth it. You will finish reading this and every time you get up in the morning you will say "Go Man Go" to yourself. So go man go! How to upgrade you life like James Bond without being shot at! I have the original book which was great, but was written along time ago. This new updated ebook has 100 more pages of updates and additional information, making it even better. The author has added some Daniel Craig Bond examples, bringing it up to date, and it is really fun to read. Good techniques on each page!